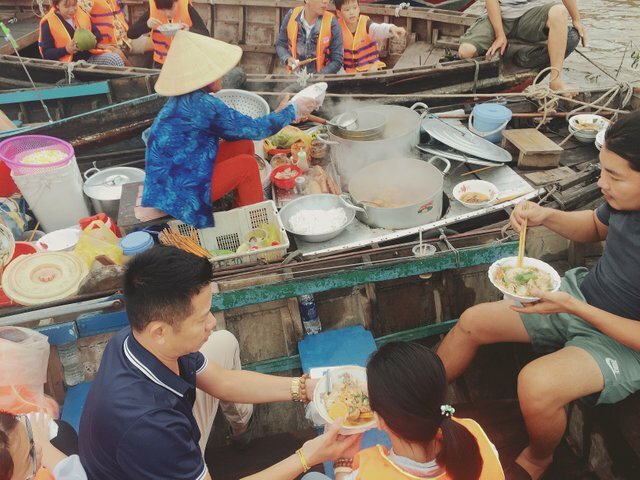 Having noodles on floating market is one of the most memorable experiences of mine while I was traveling Can Tho - the province in South West area of Vietnam. I have been traveling quite a lot around the world, but haven’t explored my own country at all. 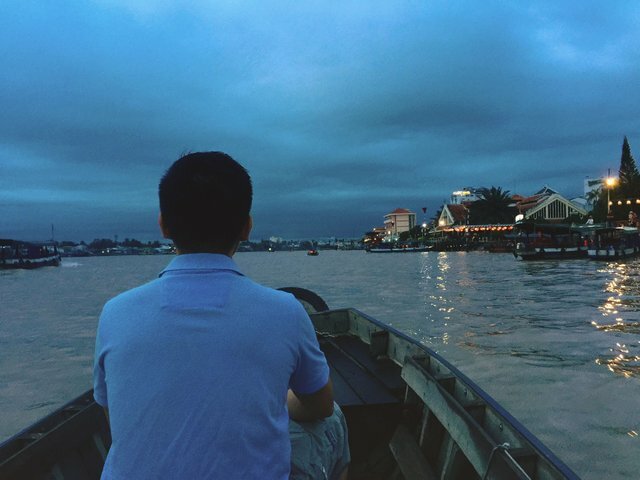 When I was in Saigon, I took a chance to discover the South. In which “the West heading Tour” is one of my favorites and also an unforgetable journey. The West here means the west of the South. This area is well known for the life style of “river-folks” and the richness of agricultural products. 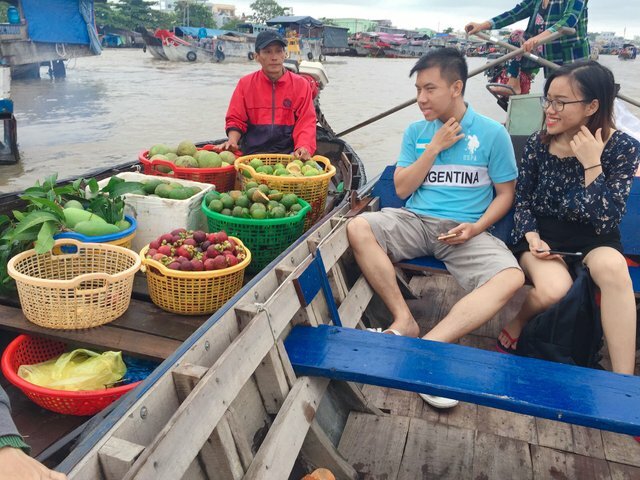 My weekend journey starts from Saigon, stop by My Tho - Ben Tre and head to the main destination is Can Tho where I can exploring the biggest existing floating market - Cai Rang. Can Tho city is also called Tây Đô - means Western Capital. This city has never officially become a capital of Vietnam. However, due to the favorable geographical location of traffic, trade, military,... and also located in the center of the Mekong River Delta area, that is why Can Tho has been considered a capital of the region. Can Tho is a prosperous city in the South of Vietnam but it doens’t have so many outstanding places to attract tourists from all over the world. The more the city developes, the more its culture identity fades away. The thing that makes me and other travelers still want to come here is Cai Rang floating market. It is one of the few remaining ones that show the rich culture and special life style of the river folks in this South West area. 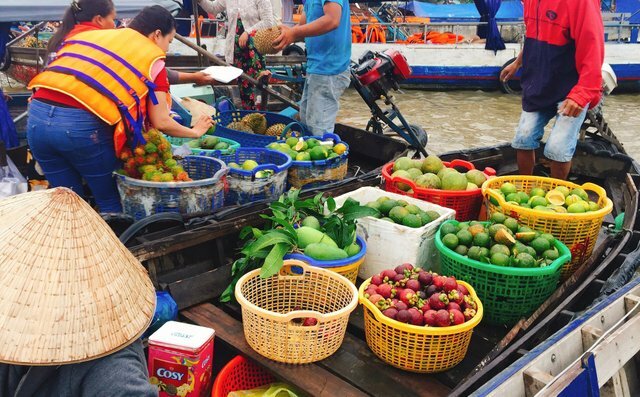 Cai Rang floating market is the largest and the most popular wholesale floating market remaining in Mekong Delta. 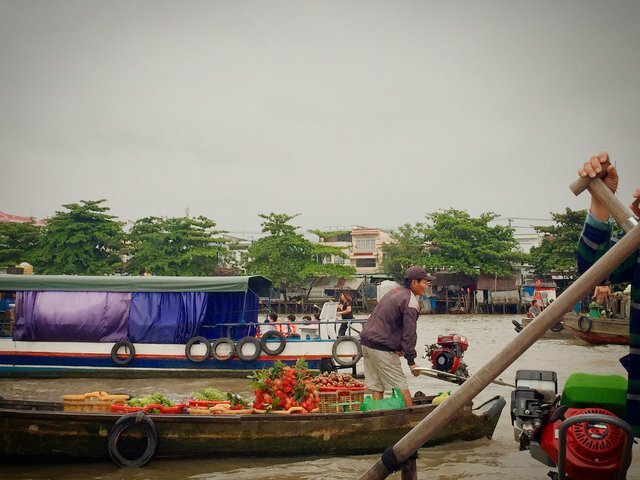 Local people used boat to transport farm products, sell and buy directly on the river. It is the place that shouldn’t be missed if you want to explore the hospitality and life style of locals. We heard that the market just operates in early morning and finish at 8am. It means if we want to join, we need to wake up extremely early. Noticed about the operation time of the market, we book the hotel right next to Hau river and Ninh Kieu Pier. We wake up at 5am and plan to get there about 6am - the most crowded time of the market. 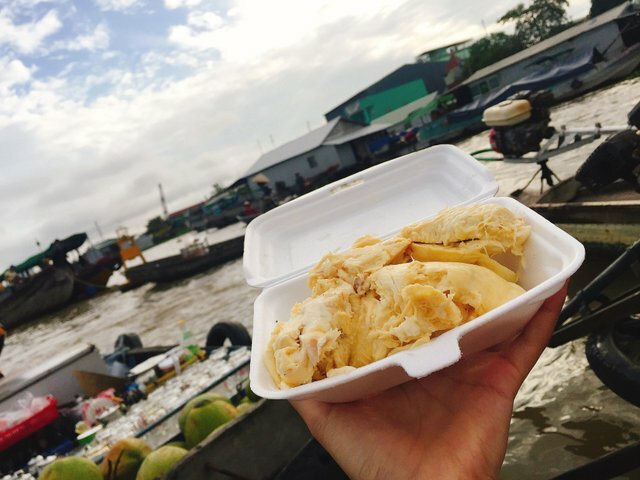 Visiting the floating market, you better go by boat to experience it fully. There are two kinds of boat you can take. One is the big boat which depart every 30 mins (just like a bus on river ^^), you will stay with a lot of people and it will simply take you there, go around for your sightseeing and go back to the pier. It is fast and cheap, about 2$ per one. But I am traveler, not tourist, so I choose the second way - taking a smaller but private boat to explore it my way. With this boat, it is driven by a local, and able to carry just 4-5 guests. The ferryman will also play the role as a local tourguide. You take the boat, you have about 2 hours and more, they will let you shoping, drinking and eating, as much as you want. The route is fixed (from pier to the market and go back), if you want to go somewhere else, deal with them to pay extra. The price for renting one boat is about 16-17$ and maximum is 5 people. Dont forget to bargain to have better deal. You can ask receptionist of the hotel to book it for you. 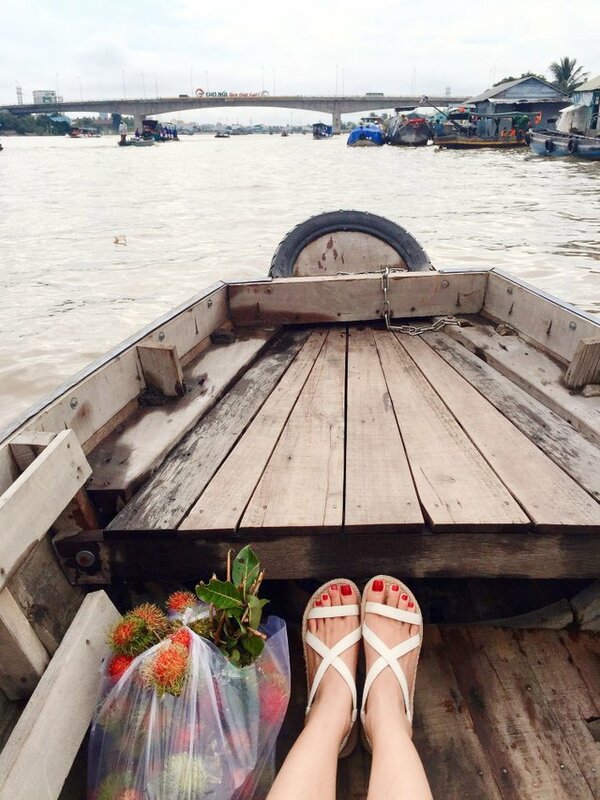 It took us 30 mins to go from the Ninh Kieu pier to the market. 30 mins of enjoying the fresh air in early morning and experiencing the main transportation in the region of rivers. We get floating market in the perfect time when it has just been crowded. Our boat slow down speed and get closer with other boats. We are gradually surrounded by so many boats selling fruits of tropical area, farm product, specialities, even coffee and breakfast. It is so exciting to be gently moved on the boat and see the busy trading scene around. Visiting this market will full of attractive products of locals, you probably want to buy some. That is ok. But don’t forget to bargain (again). The fruits is so fresh and they are willing to give you some to try first. They may raise the price ( that is why you need to bargain) but they are totally friendly. You try some but you dont buy, it is still ok. That is what I love about people here. My main purpose of visiting that market is looking for the special noodles sold overthere. 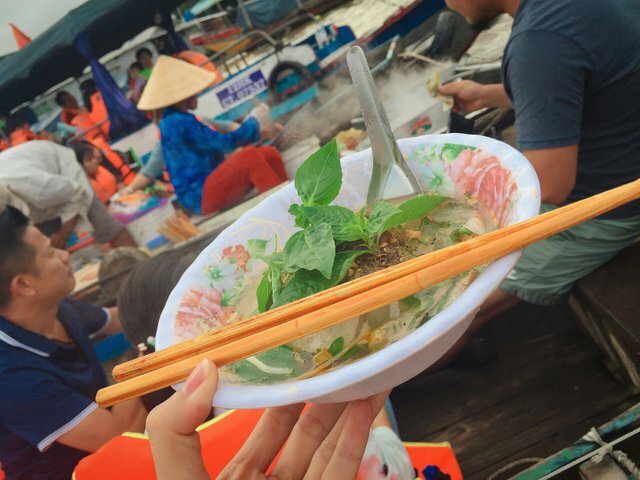 There is a boat of Hai aunt who had sold noodles (Hủ tiếu) for Gordon Ramsay. The host of Master Chef US was really impressed by that noodles on floating market and even said that it was the most amazing food he had ever had. He also brought this food to challenge contestants on his show. 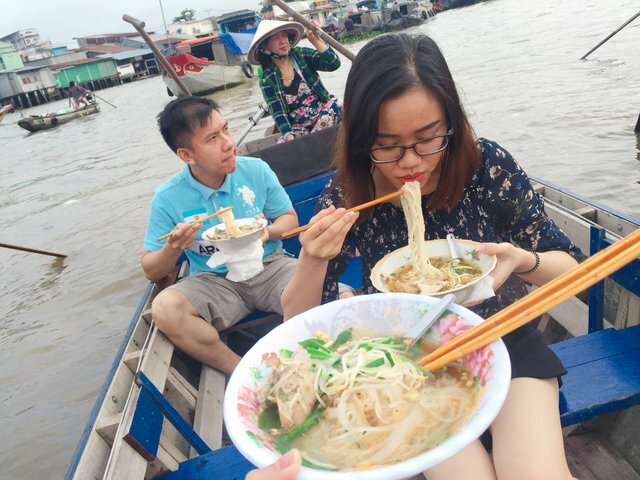 With that background, trying noodles on floating market became a must. Unfortunately, Hai aunt who sold that amazing noodles doesn’t sell it anymore. But my ferryman recommended another one to me and said that recently this new one has become really famous. When we were approaching the noodles-selling boat, I saw quite a few boats already there and a lot of tourists, even foreigners were waiting for noodles. My tourguide anchored our boat and help us to order noodles. It was really exiting to see whole process of cooking and serving. Everything was being done on the river. They cooked the broth with the huge pots on the boat and there were bowls, ingredients,... around. The woman and her husband stayed on boat, kept preparing, cooking, serving for other boats surrounding. After 15 mins of waiting, finnally I had a bowl of noodles. It was just small, not bad but nothing special. The broth and meat just normal. But it was quite expensive, around 2$. With that price, you can find so many restaurants on the ground which are much more better. However, I feel that it’s worthy. About the experience I had. The feelling of staying on boat and trying a hot bowl of noodles, while the boat gently moved following the waves. $2 is worth experiencing the culture of local people, of river-folk. So it is still a place that I highly recommend you to visit and experience. I heard that Cai Rang market was much more bigger and busier than now, but along with the development of the city, the culture of region of rivers is also faded out in the process. Open a market place floating on the river seems not necessary and gradually become unconvenient. Now locals prefer to trade, exchange products on the land. 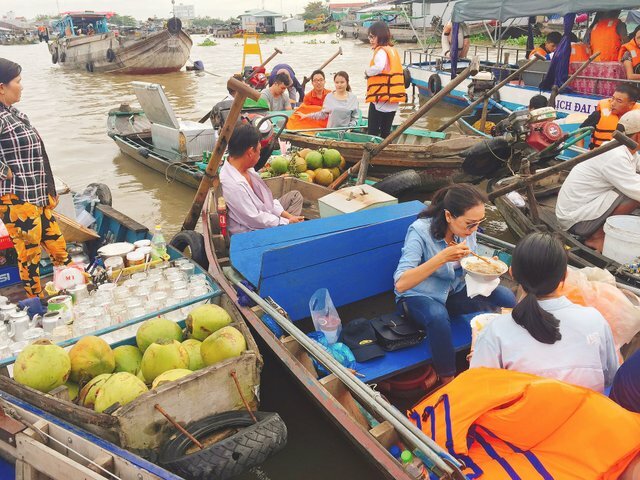 This floating market I visit, is just something remaining. And the main purpose of remaining is for benefit from tourism. I want to see deeply in the culture to understand the life style in the region of rivers, but it turns out to be too shallow. Visit it asap before it really dissapears. It really is culturally rich, I'd love to visit your country and taste all the different meals you guys have out there. Maybe, generally I'm pretty broke hahahaha, so I go to the supermarket and buy the cheappest stuff I can find. How are the prices there? @MrProf, I visited Vietnam once, and I can assure you, the food is delectable. All told, Vietnam has among the best food / cuisine in the world. That's a fact you will easily ascertain shortly after you arrive in the country. Hope you get there someday (... and hope I get there again someday). Yes, if the price of Steem rises, all of us can meet in Hanoi or some other grand locale in Vietnam for a Steeem Food Frenzy!! We loved it so much there, we did double For91days! Btw, what is “rambutan”? Hahaa. Hello~ @hanggggbeeee ^^ I'd like to try some food at that boat. Your UA account score is currently 3.647 which ranks you at #5469 across all Steem accounts. Your rank has improved 315 places in the last three days (old rank 5784). In our last Algorithmic Curation Round, consisting of 195 contributions, your post is ranked at #134. Congratulations! Your high-quality travel content was selected by @travelfeed curator @mrprofessor and earned you a reward, in form of a 100% upvote and a resteem. Your work really stands out! Your article now has a chance to get featured under the appropriate daily topic on our TravelFeed blog. This post makes me hungry, and makes me want to travel. By wooden boat or by horse cart ... or, if necessary, by train or plane. It also makes me want to go to places such as those you show in the photos. 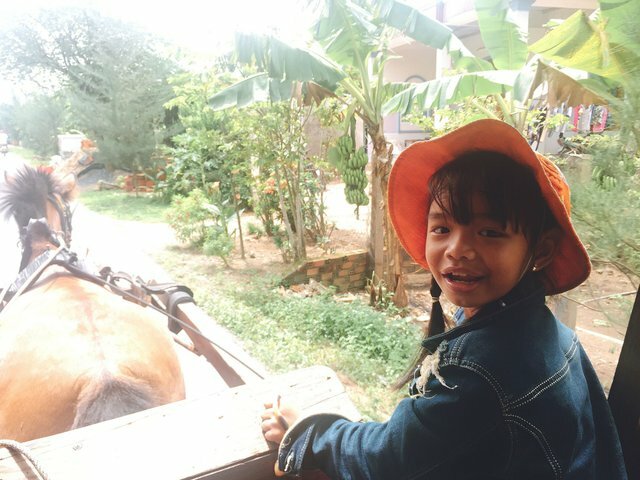 To search for great food in the floating market, or just to drift down the quiet river on a slow boat, or maybe bumping along a dirt path on a cart. Each one of them looks like an interesting adventure. That is my purpose. Make people want to visit my country, or at least, make them want to travel somewhere. haha. I think it works with you. That's a great ambition. Keep writing this type of post, and within a few years, you can be the number one Vietnam rep on Steemit! Hope you are enjoying the holiday season! !